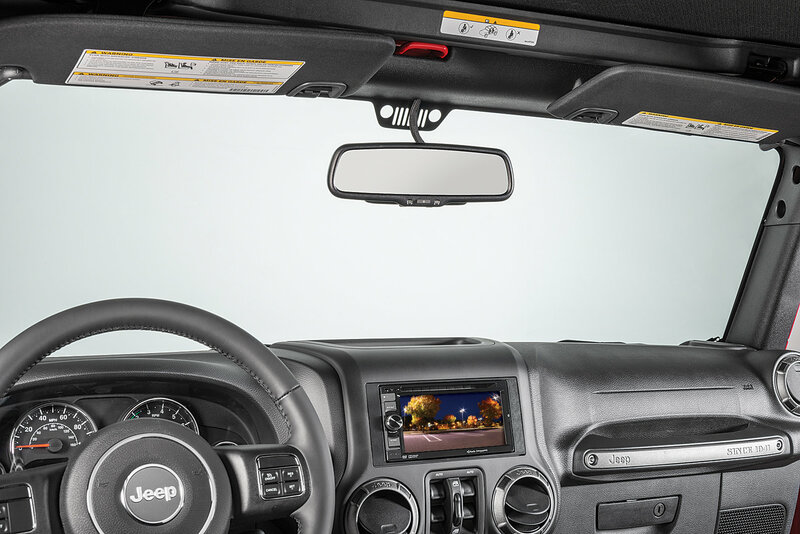 Add the safety and reliability of Rear Vision to your Wrangler. Rear visibility is often compromised by the spare tire, an undersized rear window and rear seat headrests. Our Rear Vision Systems give you the edge in back-up protection that's not available anywhere else. 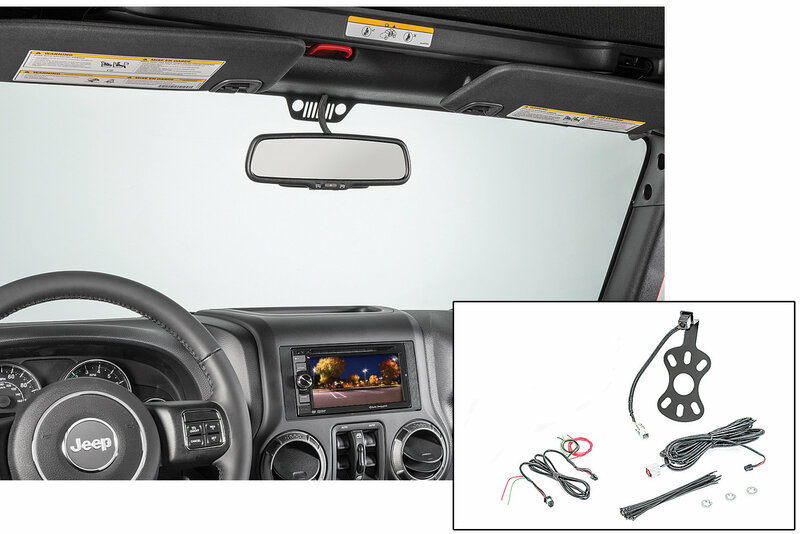 Features a unique high-mount camera system custom engineered for Jeep Wrangler. 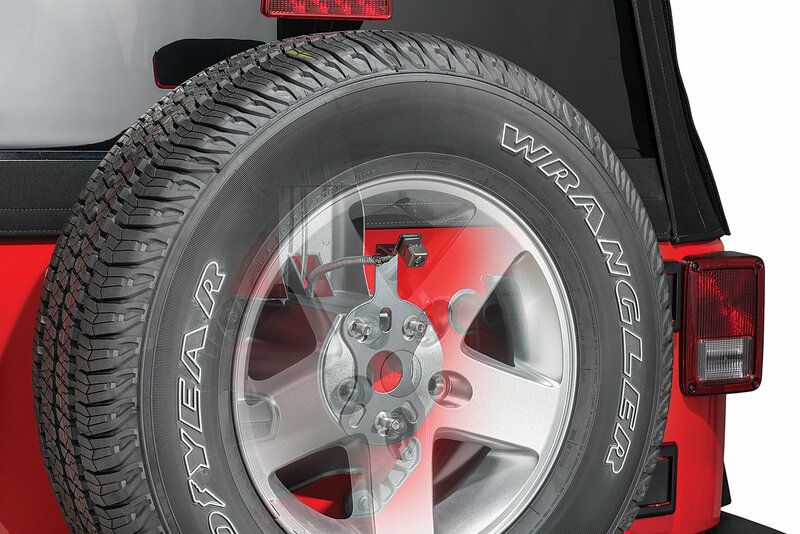 Kits include an innovative spare tire hub mounting bracket with OEM-validated camera with CCD technology for image crispness & nighttime brightness. Also includes a composite (RCA) plug for connection to video input on monitor. 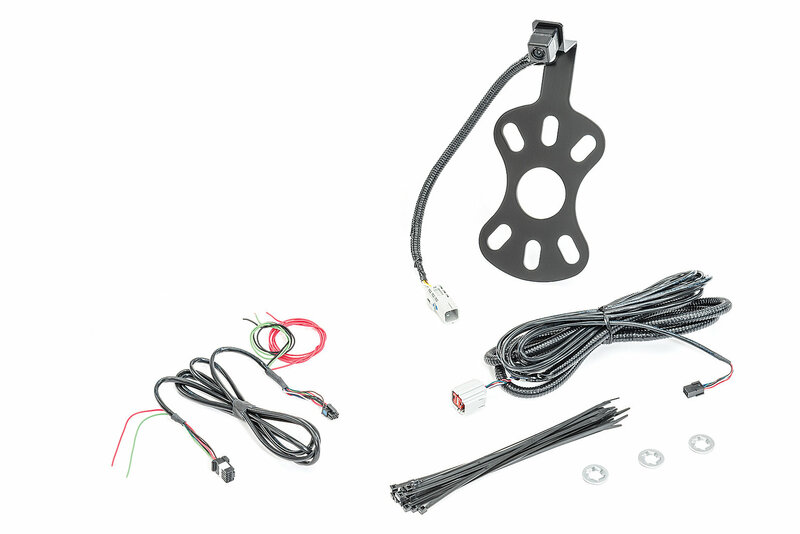 These do-it-yourself kits do not require dealership activation and can be installed in as little as a few hours. Note, if you have a typical 5 spoke alloy wheel similar to the one pictured, we recommend using a pre-adjusted camera mount kit to save installation time. All open spoke wheels may use the kits with adjustable camera mounts including 5 spoke wheels. Not designed for use on 17-18 Recon, Golden Eagle or Altitude editions. I'm using this with a Pioneer head unit, so no need for dealer activation. Installation went well, once it had been fed through the tailgate the cable routing was easier than I expected. The instructions say to connect the power leads by tapping into wires in the passenger footwell. I decided to connect them up near the head unit instead - I was already splicing the radio's harness to an aftermarket controller's harness, adding them was no extra work. (Actually I added leads with connectors so the camera can be removed without cutting any wires) The wires exit the cable at the end near the RCA connector, so it simplified the routing and saved me from having to tap into the factory wires. The camera's image is very clear with good low light performance. Field of view is good, I have 265/70 tires and the spare tire is just visible at the lower edges of the screen. A can placed just behind the rear bumper at the outer edge of the Jeep shows up on screen. This isn't the cheapest solution to adding a back up camera but installation was hassle free and the quality of everything is what I'd expect of OEM parts. I've used it with both a 17' Sport five spoke and a Sahara 18" spare wheel , it fits both with no issues. Installed this along with an aftermarket Alpine head unit. VERY good image quality and it really helps seeing around that 35 inch spare tire! Provides excellent view day or night, and works every time, unlike the factory camera in my Ram truck. Very clean looking installation that is pretty easy to do. My dealer isn't as nice as the other reviewer. They charged an hour, but that is still a lot cheaper than getting the unit that includes the programming module. I had to go in for another item on the Jeep, so it wasn't too inconvenient. Nice investment that will pay for itself many times over in preventing damage, or worse, an injury to someone that you didn't see. Does this camera system come with an actual radio? What name brand is the aftermarket radio that is supposedly with this kit? No, it does not come with an aftermarket radio. It is for use with backup camera compatible aftermarket stereos. Will this work with a 2016 Jk Unlimited Backcountry with a 430N radio, and the stock backcountry wheels?